The play of Auburn's backups — including senior forward Horace Spencer (0), junior forward Danjel Purifoy (3) and junior guard J'Von McCormick (12) — helped the Tigers this past weekend win their first SEC basketball tournament title since 1985. Auburn has earned consecutive bids to the NCAA basketball tournament after sitting out the 14 previous March extravaganzas. 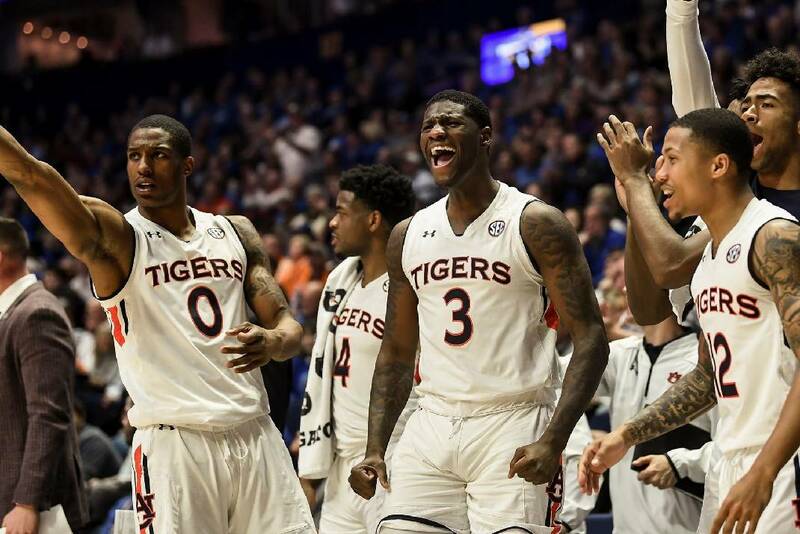 Bruce Pearl's Tigers were a 4 seed in last year's tournament after winning the Southeastern Conference regular season and are a 5 seed in this year's event after claiming the SEC tournament title. In both instances, the NCAA tournament selection committee chose to send Auburn a long way from home. "One of the reasons the pod system was created, I thought, was so that they could try and get your fans a little closer no matter what region you were in," Pearl said Monday. "I don't know that the fact you don't make the tournament very often should have anything to do with it. Last year we went to San Diego, which is a gorgeous city and a wonderful experience, but unfortunately we could not share that experience with a lot of our fans because of the expense and the distance. "Now we're going to go to Utah, and I'm disappointed that there wasn't any sensitivity given to the fact we weren't able to get much closer for our students and our fans. Our team can get there, and we're going to have an amazing experience in one of the most beautiful areas of our country." Auburn is among the hottest teams in this year's NCAA tournament, having won eight consecutive games to improve to 26-9. The eighth straight triumph came by surprise, as Auburn cruised to an 84-64 thumping of Tennessee in Sunday's SEC tournament title game. The Tigers had been one-and-done in their three previous SEC tournament trips but won four games in four days to earn the program's first league tournament championship since 1985. "We've had some struggles and went through some adversity early in SEC play," Tigers senior guard Bryce Brown said Sunday in a news conference. "I can't blame those who doubted us, and we knew what we had to change. We changed those things and made sacrifices as a team, and that led us to this right here. "We still have a lot more to prove and a lot more to accomplish." Auburn was being viewed among the nation's biggest disappointments after a 2-4 start in SEC games. The Tigers played four of their first six league contests on the road, and one of their first two homes games was an 82-80 loss to Kentucky. An 80-53 humbling at Kentucky on Feb. 23 saddled Auburn with a 7-7 league record, but the Tigers finally started to string some successful showings, rallying from 13 down early in the second half to stun Alabama 66-60 on March 5. The Tigers followed that with an emotional 84-80 topping of visiting Tennessee. "When guys are trying to define their roles, they may not share the ball or make the extra pass or give as much on the defensive end because they're not getting as many opportunities on the offensive end," Pearl said. "Towards the end of the season, roles are more defined, and there is more trusting of the process and trusting teammates and not being jealous of another man's success. Sometimes it just takes going through experiences." Auburn made 53 of its 3-point attempts during the SEC tournament and now has 396 for the season, shattering the league mark of 361 set by Arkansas in 1995. The No. 14 Tigers will open NCAA play Thursday afternoon against the 12th-seeded New Mexico State Aggies, the Western Athletic Conference champions with a 30-4 record and a 19-game winning streak. "We won't be able to be quicker or faster or more dangerous from 3," Pearl said, "because we're playing a team that looks a little bit like us." Pearl is entering an NCAA tournament coming off a victory for the first time since his final Wisconsin-Milwaukee Panthers team won the Horizon League in 2005. When he and his Tigers returned to Auburn late Sunday night, they were greeted by a celebration at Toomer's Corner that included Gus Malzahn and his football team. Auburn is making just its 10th NCAA tournament appearance but has advanced in each of its last eight trips. If the Tigers get past New Mexico State, they potentially would have to keep advancing at the expense of college basketball's three winningest programs — Kansas (second round), North Carolina (Sweet 16) and Kentucky (Elite Eight). Their Midwest Region bracket is widely considered the toughest of the four, but the Tigers are not lacking in confidence after winning an SEC tournament that contained three top-10 teams. "We're very strong, especially our bench," sophomore forward Chuma Okeke said. "We're undersized, but we have a lot of heart and play hard."